Hold the Mini Opener comfortably in either hand, place the cap inside of the Mini Opener, keeping the wrists straight and arms relaxed, twist the Mini Opener counterclockwise. The seal will snap easily and give it just a little more twist and the cap will come completely off. 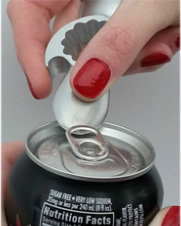 If the cap ever gets stuck in the Mini Opener, just use your finger to push it out through the backside of the opener. Place the edge of the hook under the edge of bottle cap, while gently pressing the blade into the cap in a prying motion, the edge of the hook will pry up the bottle cap and it will fall off. Push the edge of the propeller blade of the mini opener against the edge of the soda can tab, and the tab will pop right up. Pry the tab of the pop can up away from the top of the can.